Chinese New Year is a time where many embark on an exodus to the promised land: the dining area first, then the living room’s coffee table. It’s a familial flock, with familiar kind of food to boot. Fighting for your attention, and gustatory perception, are containers of buttery pineapple tarts; quite-chalky but melt-in-the-mouth kueh bangkit cookies; crunchy love letters; piquant prawn rolls; sweet-and-smoky bak kwa — the list just goes on. There’s also a traditional ‘Tray of Togetherness’ always lying around somewhere during this season. The red, usually round platter has eight compartments packed with colourful morsels of auspicious and symbolic Chinese New Year goodies, including candied winter melon, which denotes ‘a sweet and healthy life’ and lotus seeds, signifying fertility. In relatively modern times, childhood sweets such as the ‘White Rabbit’ candy and tacky foil-covered chocolate coins have made their way into the meaningful mix, diluting the overall precept somewhat. And it’s this ease of easy enhancement and rising modernism that has littered the market with truly mindboggling finds. Durian-flavoured bak kwa and nasi lemak cookies are just some new-fangled, millennial-centric mutations found in Singapore this past few years. Everyone thinks it’s innovation or die. But thankfully, that’s it. They are merely innovations, hardly disruptions. When we say disruptions, we mean new creations that totally displace the old. And many of Singapore’s esteemed chefs do not want to displace the typical Chinese New Year staples you know and love. Their novel creations are all done in the name of fun, they say. His special pandan-azuki layer cake reflects Singapore as a cultural confectionery melting pot, combining Asian ingredients with Western styling. The concoction also blends the better of two vernacular flavours: red bean and pandan, reminding us that some of the best baked makings are borne from fusing our personal culinary history with present relishes we learn to appreciate. “I like a combination of familiar and fresh. I know looks matter greatly during this time; certain colours, for instance, symbolise auspiciousness. But for me taste is paramount,” Koh avers. For dessert doyen Janice Wong, traditions can be tweaked a little. “Every year we respect the traditions but present it in a modern way,” says the 35-year-old chef. This year, she made pineapple tarts — dipped in chocolate — and bak kwa cookies. Asked which is more important: how it looks or how it tastes? Wong answers “how it tastes” without hesitation. 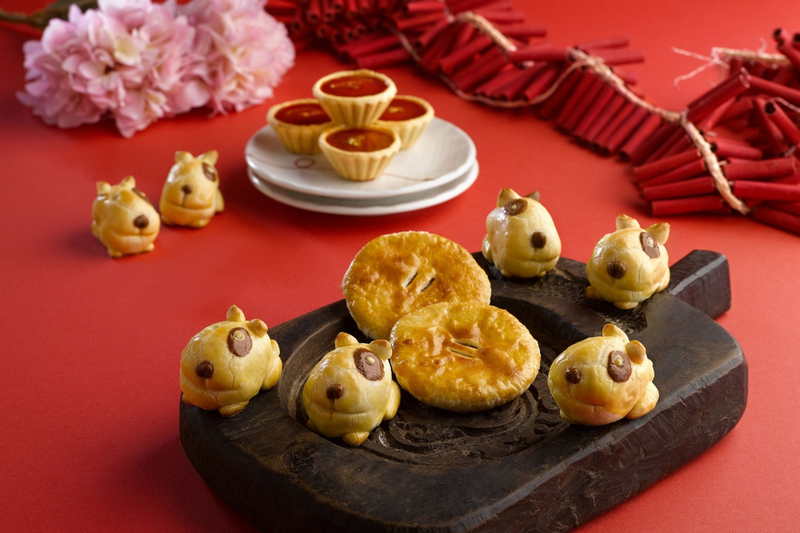 Meanwhile, clearly contending in the looks department, chef Leong Chee Yeng of Jade restaurant at The Fullerton Hotels Singapore boldly presents his version of epic Chinese New Year goodies in the form of bulldog-terrier-shaped pineapple tarts. If dogs are man’s best friend, these tarts could be your taste buds’ new hangout buddies. So it seems novelty and familiarity can co-exist in many confectioneries and Chinese New Year goodies. Chef Leong’s new colleague, Siddharth Prabhu, who recently joined The Fullerton Hotels Singapore as executive pastry chef, concludes it pretty well: “I think there are more people seeking new experiences these days so it’s equally important to present something new as it is to keep to longstanding tradition. It can be impactful for reaching new audiences — younger crowds that favour the novel over the traditional. Traditional folks like a good ol’ sugee cake, but younger audiences favour lighter mousse and compotes. Chef Sid’s sugee pineapple and coconut cake combines all these elements for a crowd-pleasing favourite.